by PaulEMoz in "Backdraft", "Firefighter F.D. 18", "Konami", "PS2", "twin-stick shooter"
This was a brave move from Konami. 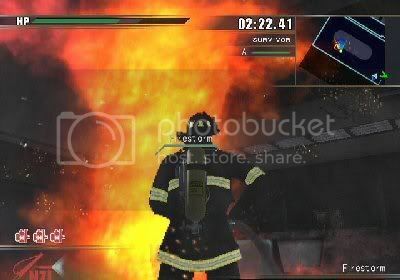 I don't mean in terms of the game's scenario... video games live or die on their heroes and villains, and you'd be hard pressed to find anyone more heroic than firefighters. No, I mean in the choice to actually make a game that's filled with fire. What were they thinking? In a world where so many people seem to prefer graphics over gameplay, with fire being so notoriously difficult to recreate, that was almost commercial suicide! Firefighter F.D. 18 is, apparently, heavily influenced by Backdraft, which is a film I've never seen. Having read up on it, I see that the fire engine in that film is Engine 17, so I wonder if Konami saw this as a kind of video game sequel? Wonder if real firefighters get trained like this? 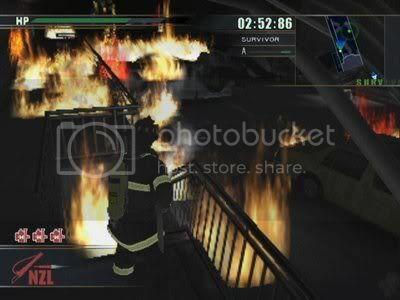 The game starts off with a massive fire in a tunnel, and people are trapped. Naturally, you want to rescue them all. You have to fight your way through the tunnel, putting out fires strategically so that you can reach everybody in time. It's impossible to extinguish all the fire, so really you're clearing a route for yourself, whilst avoiding injury as much as possible. Fires are dangerous enough in themselves, but they cause other problems as well. As you're moving through the tunnel, cars explode and rubble drops from the ceiling. 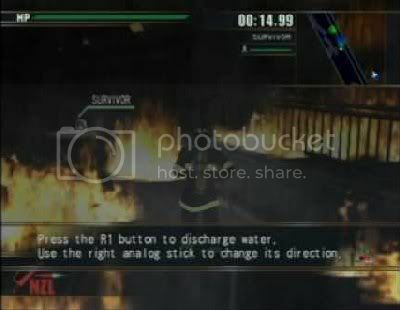 This can have a couple of effects... obviously, you could get injured, but your path to survivors can be blocked at any time by any of these obstacles, meaning you might have to find another way around. Fortunately, you have the world's longest fire hose at your disposal, so it doesn't matter how far you travel, you never run out of water. And you have your axe, so certain obstacles can be overcome. If you're strong you will survive, you'll feel the fire, burning on forever more. "Oh my God, it's Blackwell!" "He's an upcoming senator, young and prominent! Didn't you see him on TV?" It's a bit crap, but luckily, although the game is story-based, you don't have to put up with the chatter too much. The biggest problem really is that the gameplay is repetitive. Stroll around, out out some fire, rescue a useless incapable survivor, rinse, repeat. They've thrown in interesting elements to try and help with that... smoke lessens visibilty, so you have to crouch and get around, for example. And there are actually boss fights, with each end-of-level having a particularly vicious fire to tackle. Cleverly, they've portrayed them as monsters... not in terms of how they look, but they roar and spew out fireballs and the like... it's pretty well done. Mmmmmm, this one's got a smashing orangey bit. Firefighter F.D. 18 is an interesting game. If you break it down and think about it, it's actually a twin-stick shooting game, but it's different to almost anything else you've played. It can get pretty intense, especially when a survivor's health bar is draining and you're struggling to get through to them. That extra human element really adds weight to proceedings. It's a shame in a way that the repetitive nature of the game overshadows things to a degree, but if you keep sessions limited to fairly short bursts, Firefighter F.D. 18 could be a very welcome addition to your games library.